Today’s Nice Price or Crack Pipe GTI comes from an era when VW’s were not, shall we say, the most reliable cars in the world. With the VR6 however, they were still pretty fun. Let’s see if this one comes with a price that keeps the fun coming. I got ninety nine problems, but a Bimmer with electrical issues ain’t one. I’ll bet the seller of yesterday’s 1997 BMW Z3 wishes he could be like Jay-Z. Instead, he’s saddled with trying to sell his beloved but broken Bimmer. Not only that but he’s in a state where a check engine light can put a stop to title transfer. Considering the hurdle that creates, it’s equally heartbreaking that he set himself another with his $2,100 asking price. Tempting as that all may have been, in the end 54 percent of you added to his woes with a Crack Pipe loss. Old German cars and finicky behavior go together like one-night stands and STDs—there’s almost always bad with the good. A very good old German car (henceforth OGC) when it works well is the VW GTI. With the narrow angle VR6 engine under its hood, the little hot hatch gets elevated past very good to almost great. This 2000 GTI GLX VR6 looks pretty good. The car comes from a bygone era when the Golf GTI could be had with a lighter two-door/hatch body and that has its pros and cons. Styling wise the MKIV Golf has held up very well. Reliability from models of this era however, has proven not to be a strong suit. That being said, the 2.8-litre VR6 under the hood can make wonderful sounds and is able to apply its available 174 horses with aplomb. This one is said to have a new clutch between that skinny six and the five-speed transaxle that sends those ponies to the front wheels. The wheels themselves are 18-inch Aristos like on an R32 and look to be in fine shape. Both bodywork and the red paint seem to have held up well over their almost two-decades of life and aside from the wheels the car looks to be much as it did when it left Wolfsburg. On the down side, there looks to be an issue with the front bumper on the passenger side. Did it get in a shunt? What’s going on underneath? The interior also exhibits some problems. Now, when I think GTI I naturally envision plaid sport seats because I freaking love plaid sport seats. As this one sports the range-topping GLX trim package it has leather—black plaid-less leather. That leather shows some wrinkling, and that likely means some breakdown of the underlying cushions. The leather topping at least seems unbroken and free of major issues. Aside from some GTI floor mats the rest of the interior looks to be stock, right down to the old school AM/FM/cassette with separate CD spinner in the center stack. An automatic climate control sits beneath that and sports a confusingly similar control panel. The only major flaw in here is a passenger-side airbag cover that looks like it’s losing a battle with the sun. It’s curling at the corners, and if you’ve ever watched the winter Olympics you’ll know that you’ll never medal if you curl at the corners. Aside from that, the car appears to show appreciably little wear for its twenty years and 99,000 miles. The title is said to be clear, although the registration tags in the pictures are out of date. Maybe it’s been re-upped since then. The seller doesn’t give much in the way of description in his ad, other than the checklist of features and the single note about the new clutch. Other maintenance and/or history goes undisclosed. That can be a bad thing on a GTI of this age. As we noted, OGCs can be problematic, some more so than others. Things that you might not expect to go wrong, like coil packs, can and do on VW’s of this age with regularity. Electrical issues and suspension wear from aggressive driving can also take their toll. That being said, a VR6 GTI is a super fun car to drive, even today in the era when small turbo four-bangers being the norm. It’s a unique factor and one that may make this GTI a keeper in the long run. Before then however, you’d have to get past the stumbling block of the car’s price. The asking is $5,495 ($5,895 on eBay!) and while that’s a lot for a 20-year old GTI, this is the top of the heap when it comes to 20 year old GTIs. 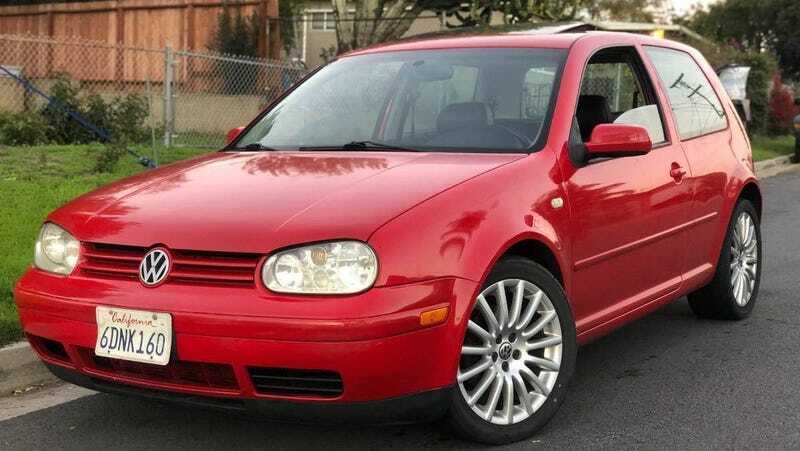 What do you think, is this VR6-equipped GTI worth that kid of cash? Or, is that too much to go OGC without knowing its full history? Autoblog Classifieds out of San Diego, CA, or go here if the ad disappears. For $8,500, Could This 1983 VW GTI Be The Prescription For Fun?